How old is mosaic art? Mosaics go back more than 4000 years. Early cultures of ancient Mesopotamia, Egypt, Greece, Rome and Byzantine all created their own unique stylizations of the art form. Your logo is “I See My Work as the Juncture of Painting, Sculpture and Drawing.” Can you explain how you incorporate each of those 3 elements into your work? I am "sculpting" pieces of tile into a "painterly image" using the grout lines as "drawing "lines. I like how in one of your videos (Ruth Weisberg for Philly Creative Guide - July 8th, 2011) you say, in discussing the National Constitution Center mosaic, that you made the three branches of government at kids’ height. You can see the fingerprints and smudge-marks of kids on your finished work. Where do you find the materials for your work? How do you choose them? I do not know much about firing tiles or blowing glass. I find available materials or have tiles custom fired for me. I collect broken shards from glass blowing studios to use in my mosaics. The purpose for this is that since the broken shards are convex and concave, I can infuse bas-relief ideas into my design. The glass shards can be tricky to work with as they are in fact jagged curved fragments. I also like to use various semiprecious stones and minerals. They provide a range of visual patterns and textures into my artwork. Stones can be employed in the form of tumble pieces, cut slabs or raised crystalline forms. Some minerals can be difficult to work with as they can have internal fractures and pitting. How do you research which topics/themes to incorporate into your art? For ex. The National Constitution Center or Casablanca? How does being a historian help you with your work? I was an American history major at Northwestern University (CAS 1984). This trained me as to how to conduct historical research. 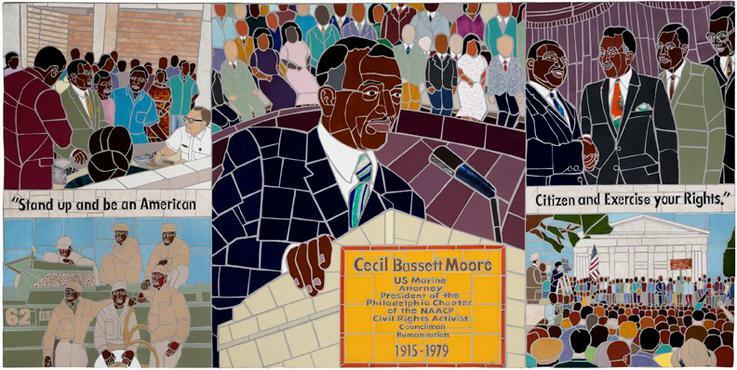 Projects like the National Constitution Center’s “We the People” mosaic and the Casablanca mosaic involved researching ways to visually capture a given theme. With Casablanca, I was able to access a range of vintage Casablanca movie posters and create an amalgam of them. The National Constitution Center had, at the time, an extremely gifted historian, Dr. Steven Frank. He helped guide me towards developing a visual theme which captured the NCC’s mandate, all the while avoiding any political bias. Please describe your Nisqually work. As I understand it you used broken shards of glass from existing works that were destroyed in the Tacoma-Seattle earthquake of 2000. How did the project come about? After the Nisqually earthquake in 2000 (in the Tacoma-Seattle, Washington area) , I contacted various glass artists in the Pacific Northwest. Dale Chihuly and Sonia Blumdahl were kind enough to send me their broken shards. From them I created Nisqually I, II and III. I have sold II and III. Nisqually I is still available. They were each 48” x 48” x 3”. A percentage of the sale went to CERF (Craft artist Emergency Relief Fund). This was in 2001. This was the first time that I experimented with using glass shards in my artwork. I enjoy the re-purposing of what would be broken waste. A lot of your works are Judaic. What’s the appeal for you in doing Judaic works? What are some of the decisions that go into crafting Judaic works that are different from your other works? I began my professional career in mosaic by targeting the niche of synagogue art. I offered congregations a visually exciting alternative to the classic wood and brass tree of life. The vastness of liturgic themed mosaic antiquity provided a diverse and rich resource for my Judaic themed art. Utilizing antiquity as a source allowed me to tap into the various ancient cultures and their unique stylistic takes on the art form. I enjoy designing and creating Judaic themed works as it allows me the opportunity to connect with my own cultural roots, delving into the ancient mosaics and their various stylizations. Judaic themed work is also an opportunity to do historic research with the goal of informing my imagery. 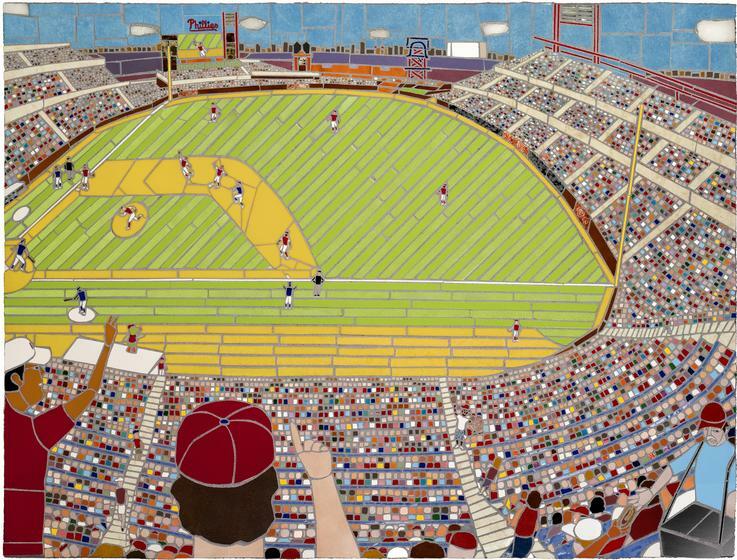 Your sports mosaics include a commissioned work for Citizens Bank Park and a portrait of Philadelphia’s Overbrook High School star Wilt Chamberlain. How do “motion” and “perspective” impact these works? What other considerations are there? Which local figure (past or present) would you love to do? I really enjoy sports themed works. They give me a chance to create compositions that highlight motion and tension as well as action and observation of action. The grout lines create the illusions of volume, motion, etc. I would love to do portraits of the stars who showcased their talents at the old Spectrum in Philadelphia. I "envision" a large scale mosaic featuring the likes of Dr. J, Allen Iverson, Wilt, Bobby Clarke, Eric Lindros, Bruce Springsteen, Billy Joel, etc. I see this as something that visitors would enjoy touching and posing in front of, as a destination at what stands now on the Spectrum site, Xfinity Live. Do you work from photographs for your portrait work? For commissioned portraits do the subjects leave the work up to you or do they demand a lot of input? In recent years, I have established a process where I import photographs from the client into Photoshop and then on a layer above, I actually design the tile shapes that will create the rendering of the subject. I can send the drawing to the client for approval. I have learned from doing portraits over the years that the more grout lines in a face, the more mature the face will look. Less lines are better for youthful portraits. It is a tricky balance as the grout line also create the sense of volume. My interest in mosaic art came through a combination of my contact with two individuals, Sewell Sillman and Selim El-Sherif. I met Professor Sillman (1924-1992) when he taught at the University of Pennsylvania’a Graduate School of Fine Arts. Professor Sillman taught two classes. One was drawing and the other was color theory. What attracted me to Professor Sillman’s approach was the brilliant way that he stripped down both of these complex subject matters into very approachable methods. DRAWING THEORY: With his drawing class, Professor Sillman shyed away from more advanced techniques of shading, and cross hatching, etc. placing a singular focus on the notion of making line act. He was able to demonstrate, through a series of carefully crafted exercises, examples of how line can create the illusion of depth perspective, the volume of form, or even a sense of the subject’s texture. COLOR THEORY: The professor’s approach to color theory worked around the daunting craft of blending colors. He asked students to purchase packs of Color-Aid paper. These kits included approximately 350 different tones and shades of color. The curriculum involved cutting pieces of a color, and applying that color to other colors. This began the process of making color act. The lesson in this class was that our perceptions of color continue to be fluid. Our understanding of the nature of a given color is relative to what background color it is applied to and the particular ratio of one color to another. Among other effects, students were able to create the illusion of making one color appear to be two different colors or visa versa. I distilled the ideas of making line and color act into the craft medium of mosaic. Pieces of colored paper were replaced with ceramic tile, glass and stone. My grout lines were designed to act as drawing lines. The lines are created by the shapes of color as they abut each other. The imagery is brought to life via this combination of color and line. I was introduced to the medium of mosaic by my class mate and friend Selim El Sherif. In studying sculpture (my major), one can learn to weld, carve wood, model clay, etc. When Selim introduced me to mosaic, I was drawn to its low-tech accessibility. Mosaic opened up the inner painter within me. Suddenly, my focus was moving toward spatial and color composition, rather than form. I came to view the medium through the filter of the insights gained in my time with Professor Sillman. Odd as it sounds, my influences come more from painting than from mosaic. My top 5 list would include: Henri Matisse, Paul Cezanne, Vincent Van Gogh, William Henry Johnson and perhaps Edouard Manet. 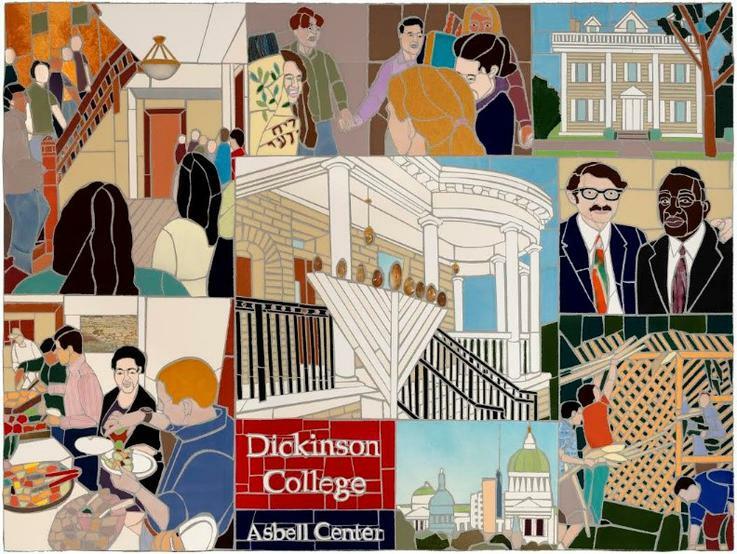 I think their art translates nicely from painting to mosaic. I often use their monographs when teaching to help students quickly work up a design idea. I was commissioned to paint for the upcoming Democratic National Convention in Philadelphia. Each selected artist was assigned two states. I was given Delaware and Connecticut. 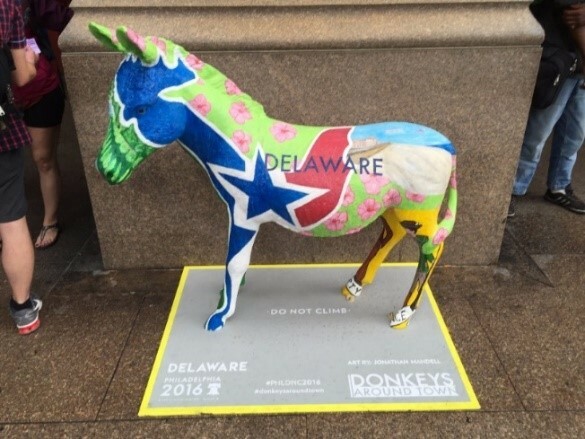 The donkeys were on display throughout Philadelphia starting July 1st for two months. 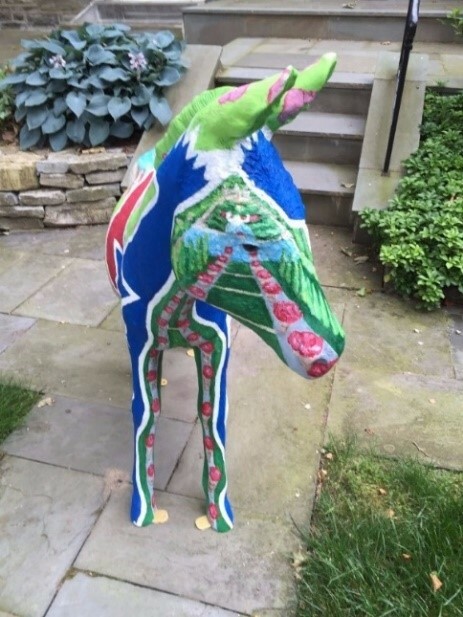 My Delaware Donkey features the Nemours Gardens on the front view as well as the Delaware Democratic Committee logo of the Blue Hen. The state flower, the Peach Blossom, is shown as well. The rear of the donkey features a Bethany Beach scene with a tribute to Beau Biden. Are there any other styles, considerations you’re hoping to explore? My goal, in my art, is all about mining different ways of seeing. By this I mean establishing unique constructs each showing a way in which the representational world can be seen. All of the artists that I named above have clearly established unique ways that the world could be visually understood. When you see one of Paul Cezanne’s peaches you know that it is his work by how it is stylized. Which works are you trying to get approved/funding for now? I would love to be able to create a piece for the Please Touch Museum. I think my art would be a great fit for the kids that visit the Museum. Where can people see your works? Citizens Bank Park, the National Constitution Center, the National Liberty Museum, the Illinois Holocaust Museum and Education Center, the University of Pennsylvania, Delaware Valley College, Bryn Mawr Hospital, Lower Merion High School, Dickinson College, the Bryn Mawr Film Institute, Beth Sholom Synagogue in Las Vegas, NV, Bet Shalom Synagogue in Minnetonka, MN, Temple Israel in SwampScott, MA, the Jewish Theological Seminary in NY, Temple Beth Hillel-Beth El and the Perelman Jewish Day School in Wynnewood, PA, the among other sites. You can also see my art at the Silverman Gallery in Buckingham PA. Tell the gallery owner, Rhonda that Jonathan sent you. Jonathan Mandell is a graduate of the University of Pennsylvania's Graduate School of Fine Arts (1987-1990). 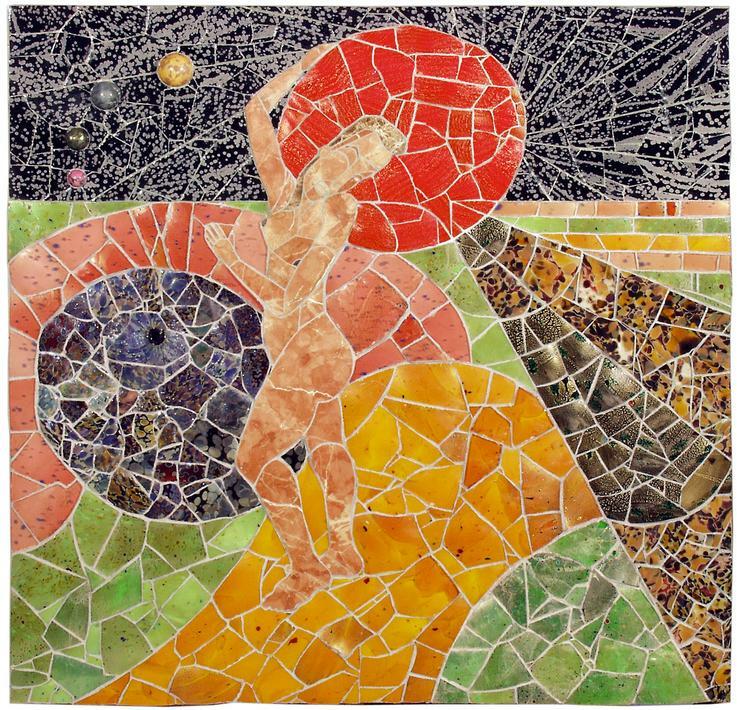 The images shown throughout this interview don't begin to show the beauty and amazement of his mosaics. 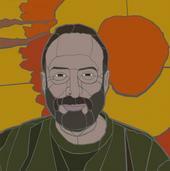 Jonathan's mosaics include public and private commissions, religious and sports works, portraits, works of nature and much more. How does doing a 3-Dimensional piece differ from 2-dimensions? Three dimensional works are a bit harder than wall mounted pieces. First, the sculptural form must have balance and be bottom heavy and top light. Once the form is created, the tile pieces must be cut at each plane break to allow the tile to continue to jacket the form they are applied to. 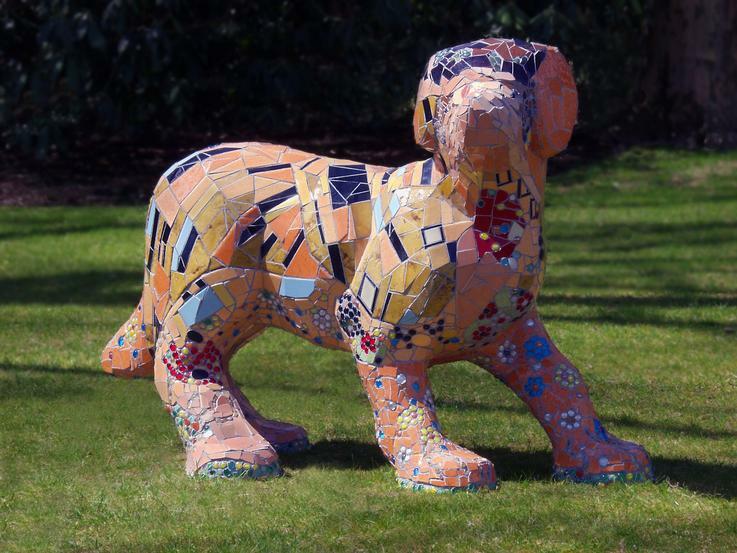 For my sculpture: Gustav Klimt’s ‘The Kiss” on a dog form, I had the challenge of recreating Klimt’s elegant lines in mosaic as they wrapped around the 3 dimensional dog form. Literally the subjects’ face wraps around the snout of the dog. The additional challenge came in with having to invent the rear points of view that do not exist in the original two dimensional artwork. Lastly as you create imagery on a three dimensional form, it must read correctly as the viewer circumnavigates the form. It must make sense from A to Z and back to A again. For videos of Jonathan's work - click here. What are the differences between doing representational art and non-representational art? In my artwork, I strive to create inventive spatial compositions, color compositions and perspectives. I also enjoy infusing a narrative quality into my art. I believe that once an artist has created a spatial and color composition, one can either choose to leave it at that point or you can offer the viewer even more with the inclusion of a narrative. I believe that viewers desire a narrative as it allows them to connect with the artwork on an anecdotal/psychological level. 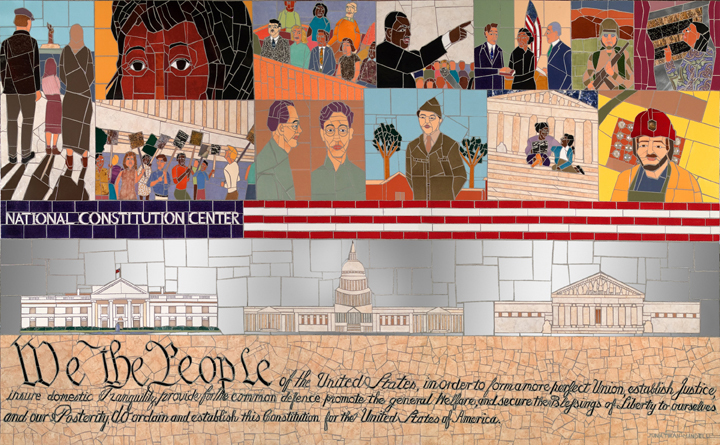 I like how in one of your videos (Ruth Weisberg for Philly Creative Guide - July 8th, 2011) you say, in discussing the National Constitution Center mosaic, that you made the three branches of government at kids’ height. You can see the fingerprints and smudge-marks of kids on your finished work. Is part of the appeal of your work (in contrast with paintings and photography) that you can touch it? Do you encourage people to touch your art? What are the other primary appeals of your work? 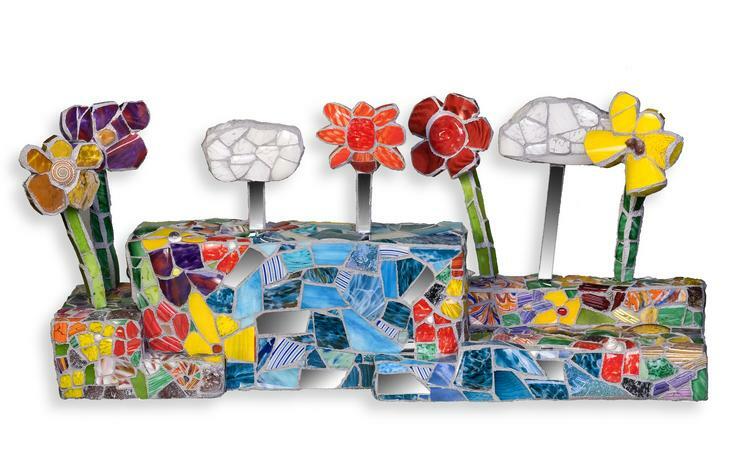 The tactile aspect of mosaic is one of the most attractive features of the art form for me. The viewer can experience the grout lines as drawing lines both visually and through hands-on physical connection to the art. The wall mounted panels look like 2-inch-thick slabs that could have been dug up somewhere. The exploration of color composition etc. puts a modern spin on the medium. I enjoy the tactile quality of my artwork and heartily encourage viewers to touch and connect with my art. Can you describe the process of getting works approved? Do you approach the person/entity commissioning the art or vice-versa? I come to my projects from a range of approaches. There have been projects where I approached a given organization and created the need for the artwork. There have been times where the organization or residential client finds me. Sometimes it comes through my website, sometimes it is via a representative such as an art consultant or architect. 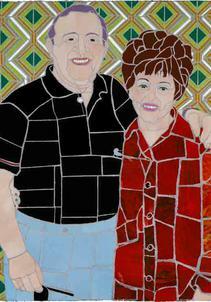 I like to create drawings to show clients how the finished mosaic will look. This is particularly helpful when creating portraits. The drawings take much of the mystery out of the process. If a client wants to see the portrait vertical, horizontal or zoomed in, it is easy to show them the different variations. Many times clients will see an existing example from my portfolio and want it customized to fit a particular site’s dimensions. I recently completed an 8ft x 6ft wall mounted panel for Bryn Mawr Hospital (shown above). The final version of the design was version 8. Many sets of eyes saw the drawing and helped to inform it. I encourage my clients to engage in the creative process with me. I have no trouble working with client feedback. I enjoy the intellectual interchange.